"Eclipse F4 essential in our growing strategy"
With 300 hectares and more than 250 employees, Hortival Diffusion (Minier nursery) is one of France’s biggest nurseries and one of the top 10 European nurseries. For 180 years, the family-owned company steadily expanded until it was bought out in 1997 by the French group Terrena. The company is known to the general public for its range of products under the “Silence, ça pousse !” brand, which is also the name of a gardening programme on France 5. This range of plants has been sold since 2016 in garden centres as well as supermarkets and hypermarkets. In recent years, Minier nurseries have successfully adapted to new market trends, particularly the increasing popularity of vegetable and ornamental gardens. Of the thousands of products it sells, the company now has a reputation as the leading specialist in plants such as lilacs and wisteria. With its own research and development department, each year the company develops new varieties which are sold not just in Europe, but as far away as the USA and Japan. Minier’s nurseries are located at five sites near Angers in the Pays de la Loire region. The region is well-known in France, and indeed in Europe, as a major player in the nursery, horticulture and market-garden sectors. Like many companies in these sectors, Minier has been using Sudlac products to whitewash its tunnels for many years, most notably Eclipse F4. According to Ludovic Leval, who is in charge of whitewashing at the Angers nursery, “it’s been nearly 15 years now that the company has been choosing Eclipse F4, which is easier to apply and gives good results. 2/3 of the 15 hectares of greenhouses and tunnels are whitewashed two to four times a year, depending on weather conditions”. “The shade protects the young plants and shrubs"
Among the advantages of whitewashing, “the main benefit is that the controlled shade ensures that the young plants and shrubs are protected against light and excessively high temperatures,” says Ludovic Leval. “Shade is essential at a plant nursery, particularly to protect the cuttings and prevent them being burned by the sun. 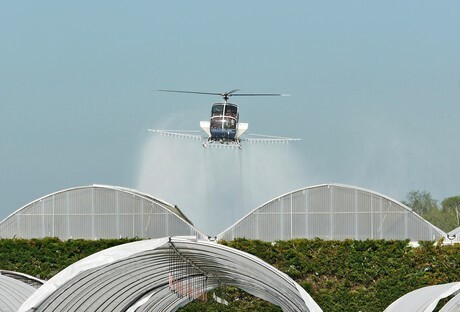 It enables us to regulate the climate inside the greenhouses and tunnels and help the plants to thrive.” For the Minier nurseries, the second advantage of Eclipse F4 is that it eliminates the need to clean the greenhouses and tunnels, as the product is slowly washed off by rain water. The third big benefit of using Eclipse F4, says Ludovic Leval, is “that it doubles the lifespan of the PVC tunnels, as the plastic degrades far less quickly once it is whitewashed”. "Eclipse F4 helps the Angers nursery’s plants to thrive"
Today, the company mainly applies Eclipse F4 with the help of a tractor, fitted with an arm, which means each tunnel only has to be gone over twice. For the last two years, it has also used a helicopter. “We first tested it in 2017, and helicopter whitewashing has proved extremely efficient, so we are now using it three days a year at three different sites,” adds Ludovic Leval.